In 2010, Jon accidentally set up his own space agency. Six years later, he’s working with some of the world’s most prestigious space and science organisations. How I Hacked My Way Into Space tells the story of one man’s mission to hack his way into space from his garden shed in St Albans, via the European Astronaut Centre to the International Space Centre. 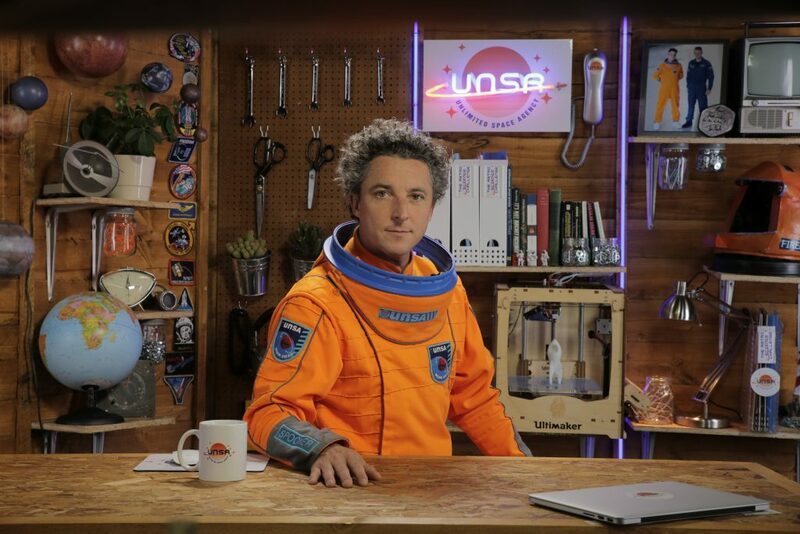 Told from the Unlimited Space Agency’s mobile HQ “The Space Shed”, this is the story of how even the smallest person can make a difference and achieve their seemingly impossible dreams. spaces – theatres, festivals, galleries, museums, the streets of your city, on the internet, in virtual and augmented realities and for broadcast. 2017 will be our 20th birthday! Our creative hallmark is the collaboration with scientists and telling stories inspired by leading-edge developments by researchers at the forefront of their fields. In recent years, we have developed work on a space science theme, in collaboration with a range of leading science partners including the UK Space Agency, the European Space Agency, NASA and The Science Museum. Commissioned by Without Walls, Just So Festival and Out There International Festival of Circus and Street Arts. Developed with support from the Mayor of London’s Liberty Festival. Commissioned by The Civic, Barnsley and Lincoln Performing Arts Centre.